We don't just sell footing... we create it. Not everyone lives in the same climate, uses their arena the same number of hours, or enjoys the same discipline; why would everyone use identical footing? Temperature, rainfall, humidity, and usage all play a part in determining what surface is right for you. FootingFirst™ has created six surfaces to fit a wide range of economic and functional needs, but we love making riders and their horses happy so we don't mind customizing. Let us help you build your surface. TravelRight™ is our signature blend. It is a completely dust-free footing that provides excellent traction, stability, and cushion. TravelRight™ performs well indoors and out, with unrivaled shock absorption and performance. TravelRight™ provides a surface similar to good turf, which would be most everyone's preference. TravelRight™ creates the closest surface to that which a horse was built to travel on with very little maintenance needed. Our TravelBright™ provides similar qualities as those found in our TravelRight™ footing. TravelBright™ mimics the characteristics of natural turf. In addition, it is lighter and brighter in color which looks fabulous indoors and out. TraveLite™ footing was created as a more cost effective and versatile blend. TraveLite™ provides more movement and shear, which allows different levels of horse and rider to enjoy a beautiful dust-free environment. TraveLite™ has become a very successful blend for many top facilities with many different disciplines and levels. Despite it's cost-effectiveness, TraveLite™ still provides a footing with good life, energy, and traction. All-Right footing is our newest blend of traditional dust-free footing. This blend will provide a good surface for many types of riding including reining, as the sand will allow the horse to slide through. However, the blend can be tweaked by rolling the footing. In doing so, you will create better stability. You can also drag it to create a more lively blend. 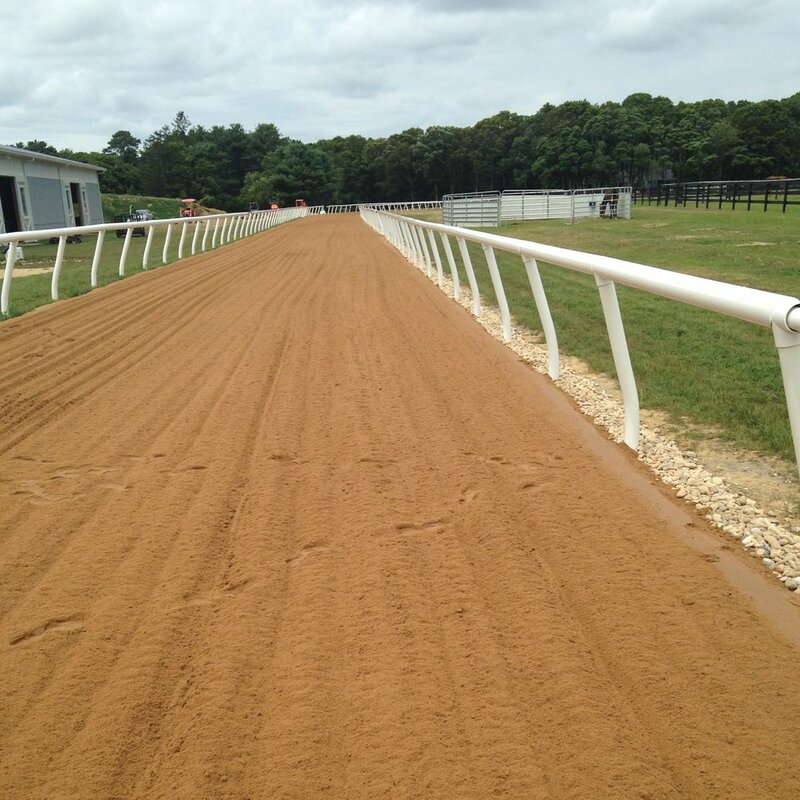 All-Right can be used for many disciplines such as the training track seen here. * Can be formulated to withstand the traffic and impact of a competitive horse show. *Can be blended to a softer mix for lighter use. Ask McLain Ward about our wonderful products. budget. Our Econoblend footing can provide the ability to begin working together with less expense so that you can protect your horse, improve your surface, and plan for a FootingFirst™ future.